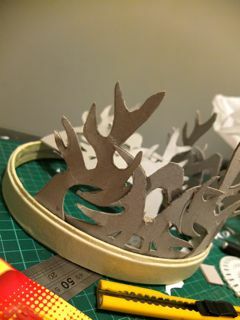 I took up the challenge to make a crown for Paul (a very dear crafting friend). He has a special dinner to attend and was simply themed 'hats'. Initially it was quite a difficult challenge as I had all these brilliant idea brewing in my head, from wiring an armature for papier mache to even using puff paints. After a few failed tries, I resorted to plain old chipboard. Ah! Why didn't I just use them ole cardboard! Duh! 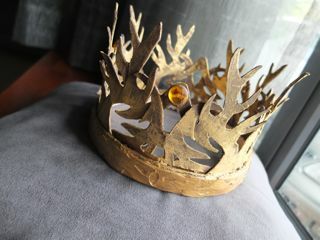 We wanted to replicate the crown from the series Game of Thrones. Cutting out the crown from the template. Drop me a comment if you want the template. Glueing the cut outs onto the circular frame. I even copied the pattern at the base to add some texture at the bottom. 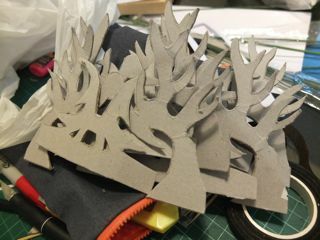 Paper crown drying. Lot's of glue here and there. A base coat of brown. Dry painting is best here, you don't want to mush up the chipboard. This material absorbs more moisture, so the paint dries really fast. 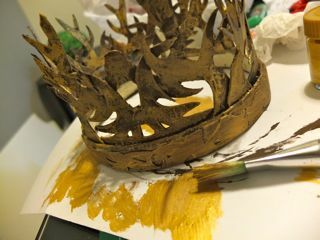 2 coats to make sure I cover the entire paper crown. Dry brushing gold onto the brown coat. Love this method! 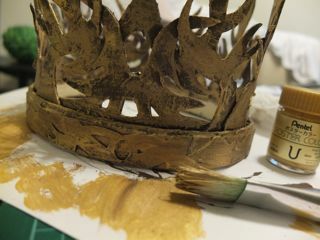 The dry brushing adds a real golden sheen to the whole crown. Looks antiquated now. 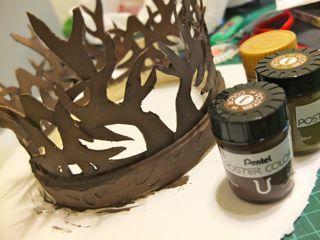 Air dry and then a layer of modge podge is applied on the inside of the crown. 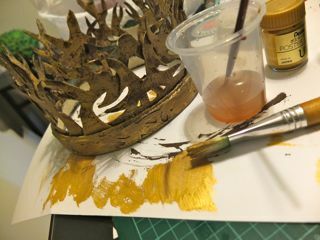 This is to make sure that the paint stays on the crown and not transfer onto the forehead. 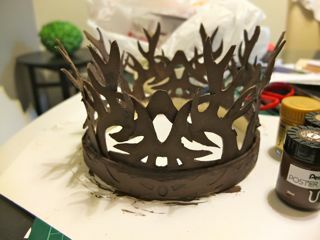 I did not varnish the front of the crown for fear of it appearing to shiny. You want the aged golden look. A strip of felt is glued to the rim for comfort. Glued amber gems on the four corners. See the felt at the brim. Close up of the gem. They're just plastic tacks I found at Daiso. Thanks Paul for the picture! Dashing isn't he?!! LOL. Hi! I'm still sending out the template. But do remember to leave your e-mail address so that I can forward you one. Thanks peeps!!! That is so freakin' awesome of you! 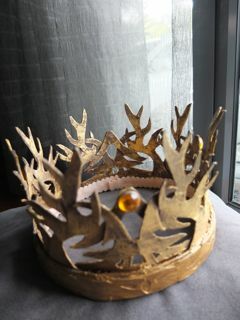 Love Game of Thrones, and I love this crown. Please send me a copy of the template. I thank you in advance for your generousity and talent. Oh my!! What a dashing and handsome prince we have here! Paul looks really extra handsome with the crown. Great job Mel. It is amazing. Can you please send me the template at miabonet@gmail.com. THIS IS AMAZING! Using this as a secret santa gift! Can you please send me a copy of the template!!! Thank you!! Any chance you could email the template to jennifer.heredia@embarqmail.com? 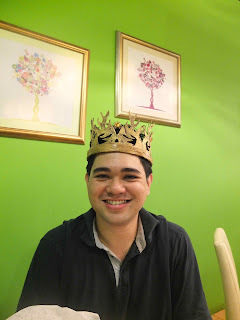 I'd like to use it to make a fondant crown for a Game of Thrones cake tomorrow!! Could you send it to bakjevandetelevisie@gmail.com ? Very nice! This is amazing! I'm a little late to post ;) I would love the template andrea.earl@gmail.com - again this is awesome - great job! Is it still possible to get the template? Thanks! That IS amazing as others have commented. If you are still happy to share, I would love a copy of the template please. That crown is awesome. Please, please send me a copy of the template. I have to make it for a cake and would be so grateful. Please email it to beverly.gallegos@comcast.net. Thank you so much. This crown is so, so amazing. I have to make one for a cake next week. Please send me the template. I would be so grateful. Thank you. This is amazing. Please send me the template. My email is beverlymgallegos@gmail.com. Thank you so much. Can you please send the template to djrswife@yahoo.com this is too cool! Can you please send a template to djrswife@yahoo.com this is too cool! Impressive! 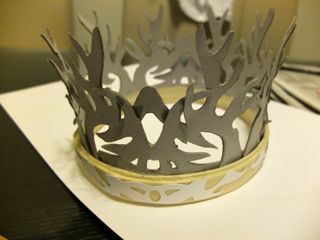 I would really appreciate the template as I'm trying to construct a crown for an amateur theatre production of King Lear. Love what you've done and would like to try it myself. Email address is social.xperimnt@gmail.com. Thanks! Amazing.can you send me the template please.thank u. Great job, this is amazing! Looking to make something like this for my husband's birthday party next week. I would so appreciate it if you could send me the template. Thanks so much! Is it too late to ask for the template? My husbands birthday is Friday and he would LOVE it! Hey, I would like to beg for the template along with all the rest. Can you please provide me with the template! I would be forever grateful! This is great! My son is attending a themed party and I'm planning to dress him up like Joffrey. Is it still possible to get a copy of the template? My email add is kwcsarmiento@gmail.com Thanks! Hey could you send me the template juansrubiano@gmail.com please! Amazing! If you're still happy to share, may you send me a copy of the template? I was hoping to make one for an upcoming hat party this week. I will definitely credit you if they ask. Thanks! Thank you! It looks really awesome! This is awesome if you could send me the template at beanwarrow@yahoo.com I would really appreciate it! I've been looking al over the internet for this template for a birthday party for my friend! If you can please send it to gabrielacastrojalil@hotmail.com. Thanks so much!! I've been looking all over the Internet for this template for a birthday party! please if you can, send it to gabrielacastrojalil@hotmail.com! than you so much!! I would love to have your game of throne crown template! Is the template still available? This is sooo cool. Can't wait to try it. Doubt it will come out as cool. Can I get the template/pattern for the crown? give me template my lord. make more stuff like this but GIVE ME A CROWN TEMPLATE. Nice work! Can you please send me the template at djtramos@yahoo.com Appreciate it! This is great! I'd really appreciate if you could send me the template please. Great job! Keep up the good work! I'm having a costume party tonight and it would be wonderful if you could share your template with me :) my email is ernest_cv@hotmail.com I would really really appreciate it! This is amazing! I hope to use this as a cake topper for my little sisters birthday. I will gladly post pics of the finished result! Could you please share your template with me? please, can you send me the template? wow.. that was really good. 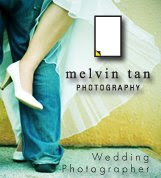 i wanna wear that on my up coming banquet..
would love to have the template, could you send it to happytobe811@gmail.com? thank you!! I would love the template, im throwing a surprise GOT birthday for my husband and game of thrones is his favorite! So amazing!!! I love to make this for my birthday (game of thrones theme ^_^) Can you please,please send me the template at nidiarivera87@gmail.com I really appreciate it! That's awesome! Thank you for sharing! Can you please send me the template at kaverzosa23@gmail.com. Thanks in advance! LOVE this! Can you send me the template at tifftran91@yahoo.com? Thanks! Awesome! Can you send me the template at okawai@gmail.com? Thank you.. such a beauty. Hi! This looks amazing! I am attempting to make one for my husband's 30th birthday. Could you please send me the template? Hi! This looks amazing! Could you please send me this template? Can you send me this template? Love the crown. Can you please send me the template at LShaffer1021@yahoo.com? Wow! That is so stunning. Great tutorial. May I please have the template so I can give it a try? Awesome work, would you mind to share the template? alverich@live.com thanks! Oh my goodness this looks fantastic! any chance I could get the template off you? :) I'm having a GOT dinner party next week! 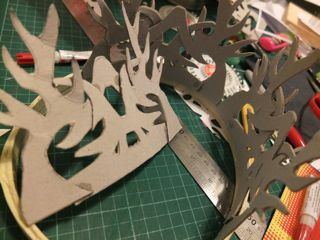 I am trying to make my boyfriend a crown for a Game of Thrones costume- could you please send me the template! It looks amazing! Hello, I have a game of thrones treasure hunt and i want to make this, can you please send me the template. 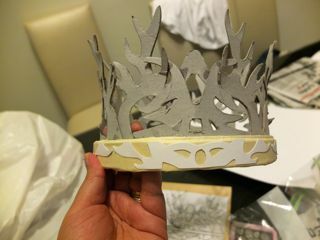 I love this crown, you did a great job. Would love to make it for theme party, please send me template if still available. Hi, I am very interested in using your template. I am making a Games of Throne Cake for next Sunday. Can you please forward me your crown template? Hi, Can you please send me your crown template. It would be perfect for a cake I have for next Sunday, March 12th. Your crown is incredible, good job!! Could you please send me the template of the crown? 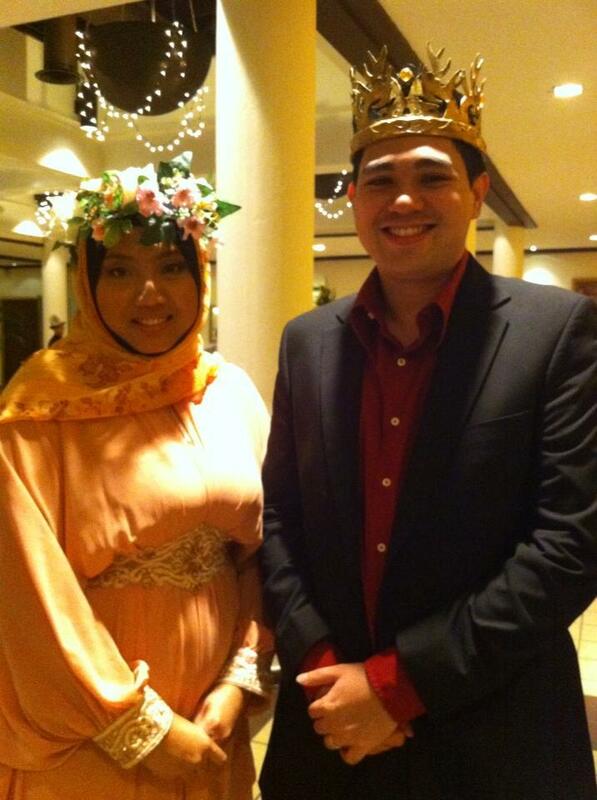 HI Dear, good job with the crown. Really good. I would like to receive the template of the crown. can u send me a template? This is so amazing!!! Please send me the template, I want to make it for a costume party. Hi, this is great! I would love the template to use at craft classes. May I purchase it? Hey, love the crown. We're throwing my son a King of the North 1st bday party and this is something i would love to make. Can i get a copy of the template? N.ogao@yahoo.com, thank you! Can I please have the template? Would really appreciate it. This is so awesome! I'm throwing a game of thrones 21st birthday party and if you're willing I would so love and appreciate it if you would share your awesome template! 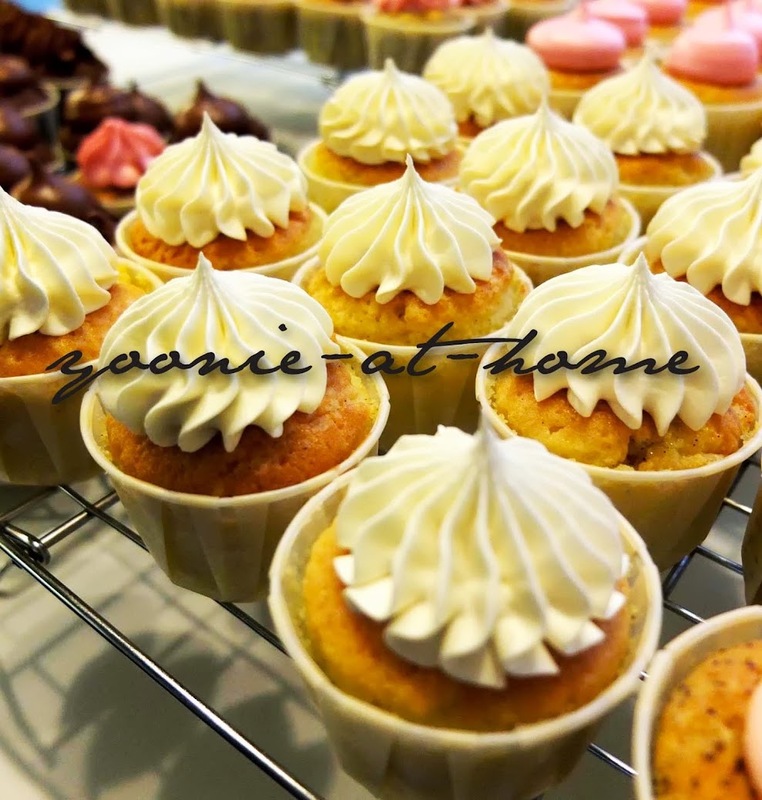 Thank you so much in advance :) I would love to make this for my party. Would love to make this. Can you please send template to. Hi! can you still send the template? :) Jeannedarc3@msn.com I would like to make it for my father's 50th birthday :D Thank you very much!! Can I have the template?! Can I please have the template as well?! If you still have the templet on hand, I would love if you could share it with me. Thank you! It is so cool. Could you send the template to wblake49@gmail.com please? Amazing! would be possible to have the template to give it a try? Would you please email me the template? davidbowieismyhero@gmail.com Thank you!! please send me a template. I would love to have it!!! I'd love the template. Going to make it for my dog lol. THIS IS AWESOME! Can you please give me a copy of the template? I will use it for a birthday suprise. Thank you so much in advance! Love your creativity, best crown ever!!!!! Please send your beautiful template. Great work. Looks really cool. 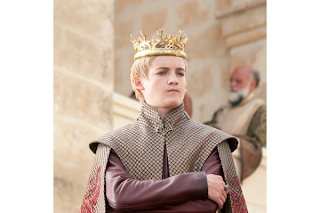 Im throwing a GoT birthday party, and would love to make this crown. Would you send me the template, please? it's amazing! Could you send me the template please? pleaseee! send me the template. Hi! Could u please send me the template too? orders@cakesbyma.com Thanks! I'm throwing a GoT party and we have a betting pool on which main character is going to die first this season. Along with the prize money I'd love to give the winner a crown when we have the season finale party. So please send me the template. This crown is awesome! Could you please send me the template. I'd love to make one for a season 7 premiere party. Please can i have the template, i'm hoping to use it as a cake decoration, it looks amazing! Could you send me the template please? miller.6045@osu.edu thank you!! Hi! It's awesome! Please send the template.. i badly need it.. thank you! It's awesome! Please send me the template.. i badly need it.. thanks! It would be so lovely to have the template. I want to make a fondant crown. Having a premiere party of course. May I have the template please and thank you!! Can you send the template to comiconnor@gmail.com? Can you please send me the template? I'm making a cake and I want to make a crown out of chocolate. And congrats! It looks amazing! I do nedd this template! Could you share me your template? 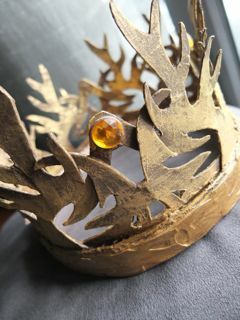 I'm hosting a got themed meeting for my classmates and need a crown for it. Please send me the template. I am making a cake for my son and this would be perfect! Love this! I am making my son a birthday cake this week and this would be extremely helpful! Free Greeting Card Download - Just Add Buttons! Sewing and crafting notions, buttons, ribbons and books! 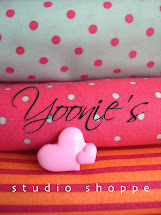 Tutorial : Felt Flower Pins for Summer! Off To A Hopping Start : A BUSY NEW YEAR!